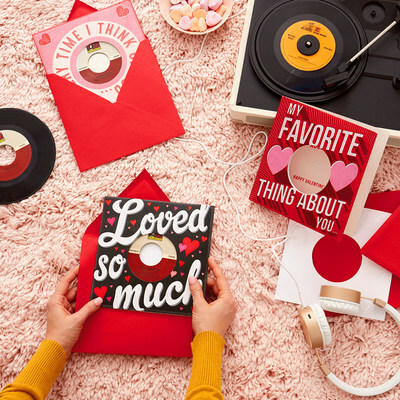 KANSAS CITY, Mo., Jan. 30, 2019 /PRNewswire/ — This Valentine’s Day, Hallmark is expanding its collection of Vinyl Record Cards with new cards featuring songs from legendary Warner Music Group (WMG) artists including Bruno Mars, Michael Bublé, and Kelly Clarkson. Each card includes an exclusive 7-inch vinyl record with two songs from each artist built into a sleeve on the card’s cover. Just remove the record, put it on any record player and enjoy the music. Hallmark Vinyl Record Cards are available where Hallmark cards are sold and online at Hallmark.com and Amazon.com. Hallmark released its first six Vinyl Record Cards in 2018, each with a 45 RPM vinyl record, featuring songs from WMG artists such as Aretha Franklin, Tina Turner, The Cars, and INXS. Valentine’s Day is the second-largest holiday for giving greeting cards, with an estimated 145 million Valentine’s Day cards exchanged industry-wide. This year, the Hallmark Valentine’s Day card collection features more than 900 designs to recognize all types of relationships including romantic, friendship, familial and more. For more than 100 years, family-owned Hallmark Cards, Inc. has been dedicated to creating a more emotionally connected world. Headquartered in Kansas City, Missouri and employing more than 30,000 worldwide, the approximately $4 billion company operates a diversified portfolio of businesses. Its global Hallmark Greetings business sells greeting cards and gift wrap in more than 30 languages with distribution in more than 100 countries and 100,000 rooftops. Hallmark Retail operates 2,000 Hallmark Gold Crown stores in five countries and Hallmark Home & Gifts sells a broad array of home décor and gift product throughout the U.S. Crayola® offers a wide range of art materials and toys designed to spark children’s creativity around the globe. Crown Media Family Networks operates three cable channels – Hallmark Channel, Hallmark Movies & Mysteries, and Hallmark Drama – in addition to Hallmark Publishing, the e-books division of the Hallmark channels, and Hallmark Movies Now, a subscription-based streaming service. Crown Center is a real estate development company that manages the 85-acre hotel, office, entertainment and residential campus surrounding Hallmark’s headquarters. For more information, visit Hallmark.com. Connect on Facebook, Twitter, Instagram, Pinterest, LinkedIn and YouTube. Atlantic Records celebrated its 65th Anniversary in 2013. Founded in New York City, the label literally grew from a one-room operation into one of the world’s preeminent music companies. Atlantic has released a string of recordings that have had a profound impact on the course of modern music, its rich history including such musical icons as Ray Charles, Aretha Franklin, John Coltrane, and Led Zeppelin. The Atlantic Records Group roster today includes many of the world’s most popular recording artists, among them Kelly Clarkson, Bruno Mars, Sia, Ed Sheeran, Death Cab for Cutie, Cardi B, Lil Uzi Vert, Flo Rida, Kevin Gates, David Guetta, Matchbox Twenty, Melanie Martinez, Janelle Monáe, Jason Mraz, Panic! At the Disco, Paramore, Christina Perri, Charlie Puth, Coldplay, Skrillex, Trey Songz, Twenty One Pilots, Rob Thomas, Wiz Khalifa, and many more.